I’d really been looking forward to this movie for a while. Baymax stole my heart from the very first trailer and he was definitely the heart and soul of this movie. Okay, basic plot: Hiro Hamada is a 14 year old tech genius who isn’t really living up to his potential. After his brother dies, under suspicious circumstances, Hiro builds a bunch of armour, recycles the plot of Real Steel and every kung fu movie ever made; and plans a way to find out what happened to his brother. Oh and Hiro has help from possibly the cutest and most loveable childlike character since Groot in Guardians of the Galaxy. 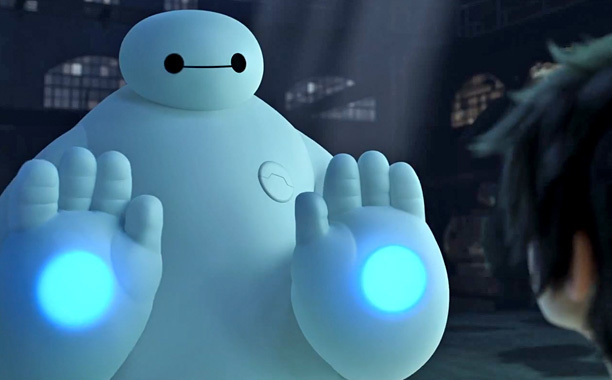 The best thing about this movie is Baymax. There’s no two ways about it. He brings the same childlike innocence and soul to to this movie that made Groot such a treat in Guardians. He’s naive, doesn’t understand general social practices and all he wants to do is help Hiro to deal with his brother’s death; if you don’t love this character, I’ll be forced to question what exactly pumps blood around your body because it can’t be a heart. 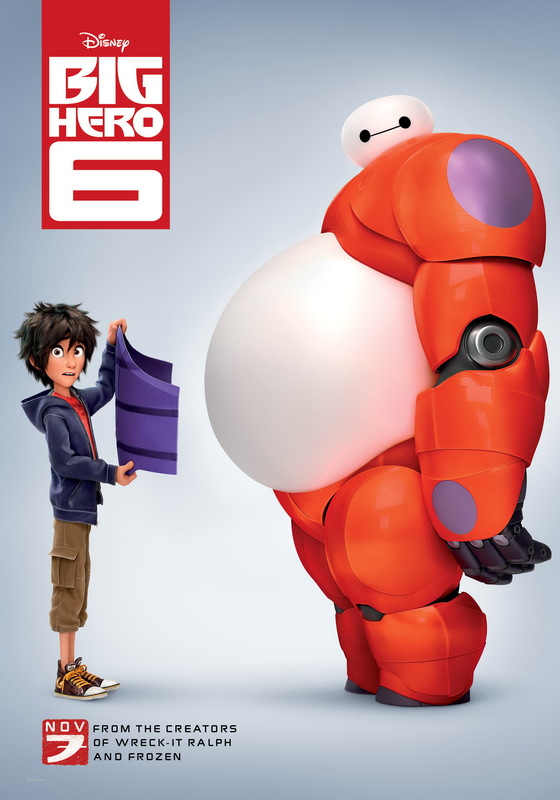 Probably the next best thing about this movie is watching Baymax and Hiro develop a bond. Baymax was created by Hiro’s brother (who is also a tech genius) to serve as a healthcare provider and Baymax perceives Hiro’s depressed emotional state as a physical illness and all he wants to do is ‘cure’ Hiro. It’s really sweet seeing the two bumble about and become friends. The movie dedicates a lot of its time to the two and this really helps you connect with the characters and since their bond is such a large part of the movie, the time spent on the two is essential. The other characters in the movie aren’t really that important. Look, this is a cartoon so characters tend to be pretty one-dimensional and underdeveloped but I did like the other members of the squad. I felt they were really well acted and that they actually added something to the story. One of my favourite supporting characters in this film (who will probably not get any recognition or praise) was Maya Rudolph as Cass Hamada, Hiro’s aunt. I really liked the way she was written and I loved her quirky, crazy personality. I think she really deserved more screen time but in a movie about superheroes there isn’t much time for aunts (unless you’re Spiderman). I really didn’t like the villain in this movie. I don’t want to spoil anything but his identity is unknown during the whole movie and when they finally reveal who it is – like you haven’t already figured it out yourself – it all feels a bit like the villain reveal at the end of a Scooby-Doo episode…”The Springfield Ghost was actually Mr Sanders, the school janitor.” I think that we’ve reached a point in film, even in children’s films, where the villain can be a worthwhile character and not just a man in a mask acting randomly. The storyline, while filled with cliches and hopelessly predictable, was filled with a lot of humour and moments to make you smile. This is a movie aimed at kids so I guess I can’t be too angry over the dullness of the script at times but, don’t get me wrong, this movie is genuinely fun to watch and I had a smile pretty much throughout the entire movie. i actually cannot stop thinking about how much I enjoyed seeing Baymax on screen, I think my favourite scene in the movie was when him and Hiro are running away from something: Hiro tells him to hurry up and Baymax plainly responds, “I am not fast.” I know it doesn’t sound like much but the cuteness they put into that character makes that scene a classic. It reminded a lot of that scene in Guardians when Groot takes out a bunch of soldiers then looks back at the camera and smiles. Characters that are pure heart and happiness are so much fun to watch.